← Where In Princeton Is Near Transit? 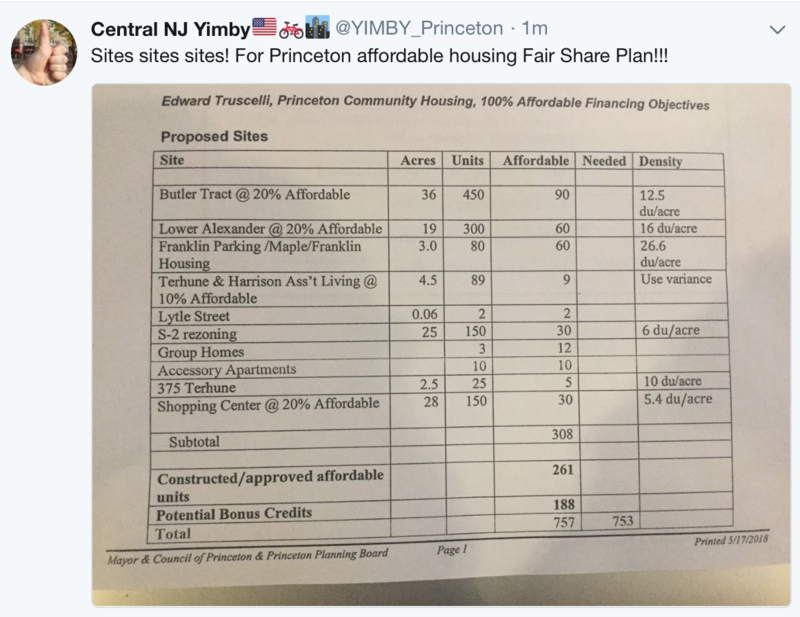 Note: This blog was written live at the Princeton Planning Board on the evening of Thursday, May 17 as the town’s new affordable housing plan was revealed. Start from the bottom and scroll up! There is an image at the bottom that lists the sites for new affordable housing! 9.07 pm I’m logging off for the night. The headline is that the town of Princeton is planning for construction of 1,259 new homes, by the year 2025, to meet state affordable housing mandates. The sites were the largest developments of affordable housing will happen are at the ‘Butler Tract’ on South Harrison St, Lower Alexander St, by Princeton Rail station, and the Princeton Shopping Center on North Harrison St. By using a large number of ‘credits’, the town has limited the number of homes that it will have to allow, but it is still a substantial number of new units! The challenge will now be to integrate the new homes so that they add to the character of the town. 8.59 pm Council President Jenny Crumiller thanks everybody for attending. She says that the documents presented tonight will be online on the municipal website first thing Friday morning. With that the meeting is adjourned. 8.57 pm Planning Board member Gail Ullman clarifies that the 20% inclusionary zoning ordinance will remain in effect for all developments that are built in Princeton, even if they are not listed on the housing plan. 8.55 pm Princeton municipal administrator Marc Dashield is now responding to specific questions raised by member of the public in public comment. He says that some redevelopment sites turned out to be too difficult based on conversations with the owners, and the town has spoken to the landowners at all the sites mentioned in the housing plan, to ensure they are interested in building housing. He says that several municipally-owned sites are either in current use, or are too small, and were therefore excluded from the housing plan. 8.53 pm Council President Jenny Crumiller again says that it is regrettable that the town could not consult the public for the planning process because of legal considerations. Regarding the impact of the new housing on schools, Crumiller says that the town is banned “by law, if not by morals” from making housing plans based on keeping kids out of local schools. 8.52 pm Final public speaker is a resident of Grigg’s Farm. He says the town should build more housing at Grigg’s Farm. 8.51 pm Council candidate Eve Niedergang is asking what other sites were considered for housing? She is particularly interested in the ‘Bank of America’ site on Nassau St. She also asks if Council has asked the land owners if they are genuinely interested on building housing on the sites that have been selected in the housing plan. 8.49 pm ‘Walkable Princeton’ founder David Keddie is speaking now! He welcomes the new affordable housing plan, says that Princeton has a wall around it that is a million dollars high- the asking price for typical properties in Princeton. Keddie says that the town should prioritizing building housing downtown, because there are 6 jobs for every resident, and that creates huge amounts of traffic from people driving into town to work. 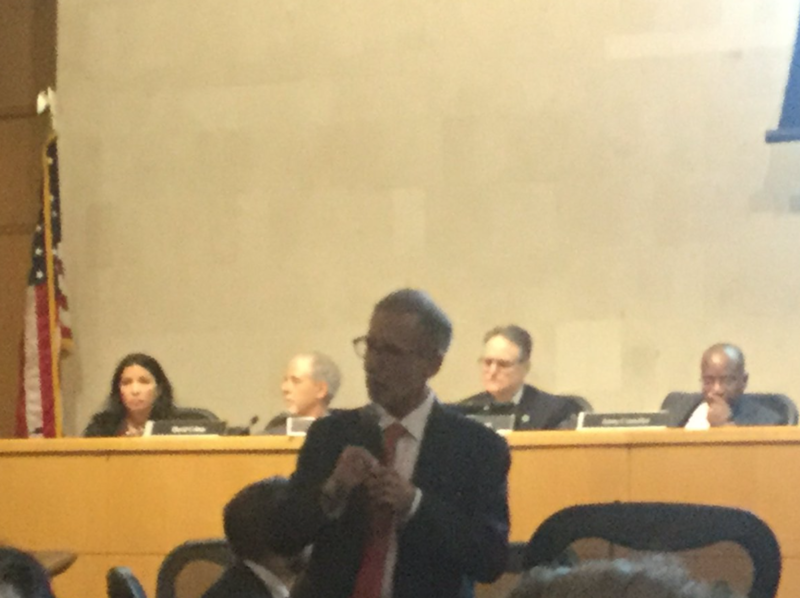 Urges Council to build on surface parking lots, upzone, and eliminate parking requirements. 8.46 pm Another commenter derides Council for not consulting the community during development of the affordable housing plan. Note: Council’s position is that this is impossible.) She says she has reached out to Chilean Pritzker Prize winner Alejandro Aravena, to see if he could build something in Princeton. Apparently he wanted to know how big the lot was going to be, but she was unable to advise him because Council had done the planning in secret. 8.45 pm Next commenter says that building affordable housing as 20% ‘inclusionary-zoned’ developments is bad for schools. He wants the town to build 100% affordable housing, to reduce the number of students entering Princeton schools. 8.39 pm Christiana Foglio-Palmer is speaking now. Says she is former Chair of COAH and former executive director of HMFA and served as co-chair on Governor Phil Murphy’s housing board. She says that the scoring system for tax credits for affordable housing is going to change, and the municipality ought to be aware of that. Foglio-Palmer says she was there at the beginning of COAH (the New Jersey Council on Affordable Housing, which regulated the Mt Laurel process) and she knows what the original legislative intent of COAH was, and it was not supposed to be a fiscal burden on municipalities. She thinks that the state and HUD might be more accommodating when it comes to financing for affordable housing in coming years. 8.37 pm Robert Powell, a resident of 40 years, who works at Nassau Capital Advisors, LLC says that the Franklin Ave site could contain *more* than 60 units. He says he does a lot of work with HMFA on 4% and 9% tax credits, and believes that Princeton’s applications would be extremely competitive, and that higher proportions of affordable housing are desirable to reduce density. 8.34 pm Princeton Affordable Housing Board member Kate Warren says that the town might want to consider more carefully the use of municipally-owned land for construction of new housing. She is concerned about the density of proposed housing at the Maple / Franklin Ave site. She thinks the plan is just ‘OK’. She also says she is ‘dismayed’ about the secrecy of the planning process. 8.29 pm Princeton Council candidate Surinder Sharma is now speaking. He says we should build a mixed-income, mixed-use development on the parking lot adjacent to city hall, and it should have a laundromat in it. 8.27 pm Next commenter is angry about lack of public consultation and believes that all the possible funding mechanism for 100% affordable housing have not been explored. He is very alarmed about the possibility that schoolchildren may live in the new homes. 8.24 pm Next commenter is concerned that some of the sites identified for housing may not prove suitable. It may not be possible to build on some of them. What is Council’s back-up plan? 8.22 pm Public comment has now begun! First up is Alvin McGowen, a member of the Princeton Housing Board, who also ran for Council this year before withdrawing his candidacy. McGowen says “It’s time” to enact the plan, even if the plan is not perfect. He says that resistance to the housing plan is a very bad idea, because the town will probably lose in court. 8.20 pm Council member David Cohen clarifies that the town is not planning to tear down the Princeton Shopping Center to build housing. Housing would be built on some portion of the Shopping Center site. 8.18 pm Crumiller calls on housing advisor Shirley Bishop to answer the question “how many ‘100% affordable’ units can we include in our housing plan?” Bishop says that we can add as many ‘100% affordable’ units as we like, but if we don’t get state or federal funds or tax credits, then the town is obliged to pay for the housing itself. She mentions that there is substantial risk with relying on the outside finance. 8.17 pm Truscelli says that affordable housing is built to sold, quality standards, and is not less expensive than any other regular housing. Union contractors are often required under the terms of the financing, which adds to cost. He suggests that $250K per unit is a ‘rule of thumb’ for cost of a single housing unit, but adds the caveat that it really depends on the nature of the development. 8.15 pm Truscelli also cites the Low Income Housing Tax Credit, which is a competitive program, as an important potential source of equity to pay for construction of new housing. 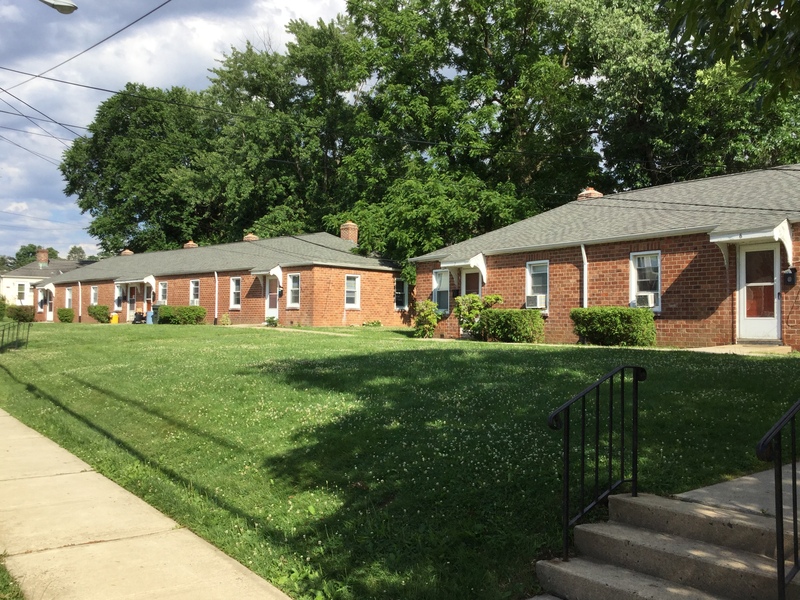 Through the LIHTC, an investor provides money to build the housing, and in exchange gets a generous federal tax credit. However, so many towns compete for LIHTC that it cannot be relied on to build a whole lot of housing. 8.11 pm Truscelli is talking about mechanism for funding affordable housing developments. As executive direct of non-profit community housing organization, Princeton Community Housing, he knows what he’s talking about. He says that mortgages, some of which are provided on favorable terms by state agencies, tax-exempt bonds, municipal affordable housing trust funds (which has somewhat limited funds) all contribute to funding the construction of new affordable homes. 8.10 pm Council President Jenny Crumiller introduces Ed Truscelli, executive director of Princeton Community Housing. Crumiller says that many people are asking her why the town can’t just build all its affordable housing as 100%-affordable developments, so as to reduce the total number of units built? 8.09 pm The court will hear and hopefully approve Princeton’s housing plan on 7.24.18. Council must then introduce ordinances to officially enact the plan by 8.13.18. 8.07 pm. Burgis is now discussing the timeline for adoption of the affordable housing plan. He says that to meet court-imposed deadlines, Princeton is basically going to have to adopt the plan by…the end of next week. 8.06 pm. ‘Princeton Shopping Center’. 150 units are earmarked for here, of which 30 would be affordable. The whole site is 28 acres, so this would be an aggregate of just 5.4 units / acre. 8.04 pm ‘S-2 site’ – This is up at the top of Mt Lucas Road. The idea is that the whole 25-acre area will be rezoned to allow new housing to be added as mixed-use development. This could allow up to 150 new homes at a density of 6 units / acre. 8.03 pm ‘Terhune / Harrison Assisted Living Project’. 4.5 acres, total of 89 units, of which 9 will be affordable. 8.02 pm. ‘Franklin Ave / Maple Housing’. 3 acres, to be developed at 26.6 units per acre for a total of 80 units of which 60 will be affordable. 8.01 pm ‘Lower Alexander Mixed-Use Site’. 19 acres, south of Princeton Rail station. To be zoned at 16 units / acre for a total of 300 units, of which 60 will be affordable. Somewhat similar to the existing Merwick-Stanworth site, which is at 20 units acre. 7.59 pm Burgis is talking sites for new housing: First, the ‘Butler Tract’ on South Harrison St. 36 acres, to be zoned at 12.5 units / acre, for a total of about 450 units. Says it is equivalent to the existing ‘Griggs Farm’ property, which is built at 11 units / acre. 7.58 pm Burgis is now discussing specific sites. He says that many of the existing affordable housing developments in Princeton don’t count toward state affordable housing requirements, because they were built a long time ago, or are restricted to Princeton residents only. 7.55 pm Burgis clarifies that for a sit to be considered for affordable housing under the Mt Laurel code, it must meet legal definitions as ‘Available’, ‘Approvable’, ‘Developable’ and ‘suitable’. He says that Princeton is also prioritizing ‘Smart Growth’ principles for identifying suitable sites for affordable housing, including walkability and preservation of valuable environmental sites. 7.49 pm Burgis is still reviewing the history of the Mt Laurel process. I just added up the total number of homes that Princeton is proposing to build to meet state fair housing requirements. It looks like we will be building 1,259 new homes by 2025. For context, there are about 10,000 homes currently in Princeton. 7.44 pm Burgis is reviewing the history of the Mt Laurel process for New Jersey affordable housing. It started in 1975, with a court ruling that every municipality has an affordable housing obligation. Princeton’s requirement to build affordable housing stems from this ‘Mt Laurel’ process. 7.43pm Princeton Council President Jenny Crumblier welcomes Joe Burgis, AICP a planner with ‘Burgis & Associates’, who represents 45 municipalities around the state, and who is going to make the overall presentation about the fair housing plan. 7.40 pm Planning Board Chair Wanda Gunning invites the public to a Planning Board meeting June 7 to check that the new housing element fits with the town masterplan. Gunning is also recusing herself from the discussion, because she has a family connection to Princeton University. 7.39 pm Mayor Liz Lempert and Council Member Heather Howard are recusing themselves from discussions of the fair housing plan, because two of the sites in the plan are Princeton University properties, and they have connections to the University. 7.38 pm Mayor Lempert welcomes Joe Burgess, who is providing planning services to Princeton for the affordable housing process. 7.37 pm Mayor Lempert is explaining that the town is making plans for 753 affordable homes after Mercer County Judge Mary Jacobson ruled that the town needed to build that many units to meet state fair housing requirements. 7.36 pm Moment of silence for former Princeton Township Mayor and affordable housing advocate Jim Floyd. 7.34 pm Mayor Lempert just called the meeting to order. Princeton Council and the Planning Board are all here. 7.29 PM I’m also really liking the announcement that 150 units of new housing are going to be built at Princeton Shopping Center on North Harrison St.
7.28 pm So the meeting is just about to start but it looks like the big news is that the town of Princeton is planning 450 units of new housing at the Butler Tract on South Harrison St, and 300 units of new housing on South Alexander St.
7.26 pm And we can announce the sites for Princeton’s affordable housing plan! See image below!! 7.00 p.m. Earlier this year, Mercer County judge Mary Jacobson ruled that Princeton must plan to allow the construction of 753 new affordable homes by 2025. Tonight, the town will announce how it plans to meet that requirement. We’ll be covering the announcement live from the Planning Board at 400 Witherspoon St. More to follow at 7.30 pm when the meeting starts! This entry was posted in Affordability, planning, Princeton and tagged Affordable housing, fair housing, planning, Princeton. Bookmark the permalink. Horrified to hear that people want the plans to prevent more children moving into Princeton. What a selfish and morally wrong stance. Talk about pulling the drawbridge up behind you! What does the ‘potential bonus credits’ line refer to? Are these virtual/imaginary affordable units?